Feeding hummingbirds can be a lot of fun. There is not much time left, in this season, for feeding them, depending on where you are located. However, thinking ahead never hurt anyone. Here's a few tips, to get you started. Don't forget to share your own experiences. You can see a video that was submitted, by one of our readers. Mixing the nectar is very basic. Just use one part sugar to four parts water, and stir until the sugar is dissolved. (Never use honey!) Bring it to a boil, on the stove, to kill the bacteria. This will also allow you to safely preserve the nectar for a couple of days, in the fridge. It will usually be fine, up to one week. Once the nectar is cool, fill the feeders. Be sure not to over fill, based on the amount of birds you have. The nectar will only last for about one or two days, outdoors. If it begins to look cloudy, change sooner. Placing the feeder in bright sun light is the best place to hang your feeder, as far as the birds are concerned, but hanging it in the shade will slow down fermentation. You do not need to add red food coloring. A brightly colored feeder will do the trick. Cleaning your feeder is a snap. Just use vinegar and water. Stay away from bleach, and detergents which can leave a residue. To keep the bees, wasps, and ants away can be a real challenge, sometimes. One suggestion is to spray the hanger with cooking oil. (This will make a mess for you later, though.) Another good idea is to look for a feeder with an ant moat, or bee guards. 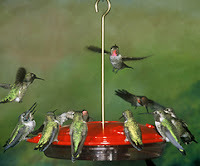 You will continue to see the hummingbirds until the insects are gone. This is their primary source of food, of course. As long as you have an audience, continue to offer the nectar. After the freeze, you will want to take it in!